Doing the A-to-Z Challenge again this year, again at Sigild V. This year will be poetry, riffing on a character from Crisis Weekly. This has the effects of the proverbial birds with a stone, as I've been wanting to do some poetry again anyway, and I figured I owed the A-to-Z folks thanks for the recent book tour thing. Pretty sure I've nailed how I'm going to be writing George & Gracie, after transcribing what I'd written in a notebook at the end of the year and not initially knowing how to proceed from there. Submitted a story. It's the Montague in the Leviathan proof-of-concept I wrote last year, where I finally buckled down and attempted some straight literary fiction, which I still hope can become a book later, if I can do the necessary research. It suddenly occurred to me that I can turn that Exemplar comic book script into something if I look into getting someone to draw it. So that's something I'll be strongly considering. It's nice to have a number of prospects in the air. And...we're done. Two hundred comic book pages (roughly the equivalent of nine standard comic book issues), nearly thirty thousand words across the whole script, a hundred and thirty-six pages in the file. It's the first time I've written a complete, extended comic book story. Thank you, Pat, for reading along. Writing this for half a year (! ), more or less once a week every week, it was a valuable experience. I look forward to moving on to new projects (or perhaps even returning to old ones, like maybe even getting on to writing out BOLO (the project for which I had eight pages of art waiting to be used). I expect George & Gracie, a project I haven't even mentioned here (it's laughable, everything I want to work on, sometimes, even from looking back at stuff I have mentioned here), to be the likely candidate, a children's story, something I haven't really tried in long form. Either way, one of the perks of Crisis Weekly was sharing regular thoughts here again, and that's certainly something I'd like to continue. Sapo Saga helped round out the A-to-Z Challenge Book Tour over at J Lenni Dorner's blog. Dorner gave it the second review of the tour, and somehow an even better one, which was very nice to read. You can read it here. Thanks, Lenni! This is the big climax of the story, the final confrontation between Bloodwynd, that obscure superhero I plucked from the '90s, and Doomsday. Hopefully everything I've done in the previous nineteen installments has justified this one, and that it does justice to them. This one's another creative departure. When I began considering writing it as something other than the usual narrative, I wanted to go with eight separate perspectives, but then I wondered if it would be more interesting, and more impactful, if it followed a single person as they aged. The story itself takes the place of a huge moment that will otherwise not be depicted (two more installments, after all, with two other big things left to do), which I thought I could get away with, since the character who dies already had a big fight earlier, and I didn't really want to cover the same narrative ground. The moments that stick out for me, in this thing, are the ones where I took risks, where I allowed myself to deviate, to try something different. I think if this were a comic book, that's what would stand out for readers, too. This is the third installment this week, although technically only the second, as I delayed last week's for one of them. If you remember, I skipped a week at Thanksgiving, so I'm really just catching up. The first time I wrote a double-length script I told myself that's what I was doing, but as far as having the material for something that was supposed to be weekly, as advertised in the title, there really ought to have been, on average, enough scripts to cover every week. So now there are, and so we're back on track. Because I had a three-day weekend, and the sister and niece were away, I decided to tackle Crisis Weekly a bit differently, with #17 and #18 both available today. It's actually kind of funny, because the latter entry was always going to be my third and final double-length entry. To tackle writing it on the same day as writing another one meant writing twenty-four pages of comic book script in one day, tripling what I'd done nearly every other entry. I happened to have the time, and narratively the entries easily segued into each other, and perhaps even benefited from being written together. That leaves three entries to go, and then it's off to other projects. Since I knocked out a script early in the week, it leaves me wondering if I will actually write four scripts worth of pages this week, if I'll go back on the clock on Saturday morning, as regularly scheduled. 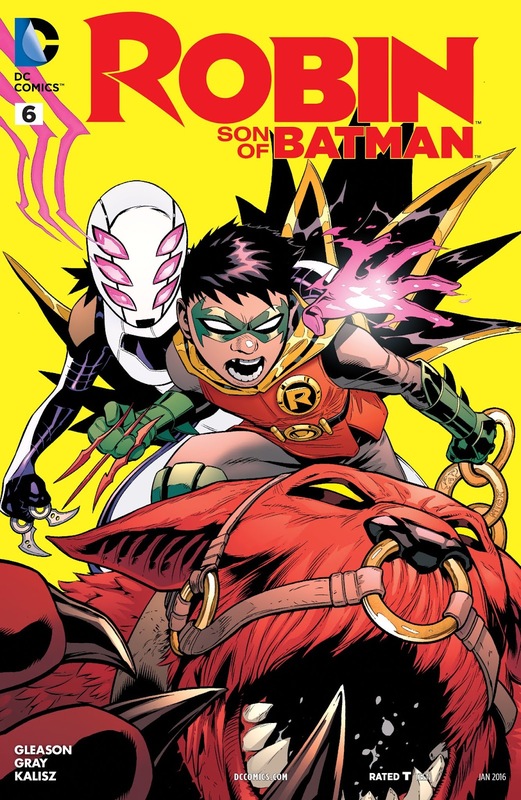 This week is sort of an ode to Robin: Son of Batman, a short-lived spinoff of Batman & Robin, the New 52 iteration by Peter Tomasi and Patrick Gleason, which I loved and became one of my all-time favorite runs. Gleason tackled Robin on his own, and as you can see from that cover gave Damian Wayne a unique supporting cast, the daughter of someone he'd actually killed, and a humungous Man-Bat named Goliath. Yesterday my novella Sapo Saga was in the spotlight! Thanks to its being written specifically for the A-to-Z Challenge back in 2016, it was eligible for a special book tour that's going on at the moment. Jemima Pett featured Sapo Saga on her blog yesterday, and also happened to give the book a glowing review! You can read it here. Holy crap! I've been waiting to write the last line of dialogue in this one for months! That's one of the joys of writing any story, knowing what's coming up and then finally getting to write it. In that way, the writer's journey isn't so different from the reader's, they just get to get there first. The whole thing will be explained later, but hopefully some of the clues will start to fall into place, and seem less like clues and more like bludgeons. I once remarked on someone else's blog that I haven't really tried writing mysteries, but mysteries can come in all kinds of shapes. We just tend to think of them almost exclusively as detective stories. But they aren't always. The Harry Potter books were, essentially, mysteries, so it was probably hugely natural for J.K. Rowling to write more traditional mysteries in the Cormoran Strike series, which I again evoke in this installment by returning the focus to Bloodwynd and his amputated leg. But there's a lot more in it, too! There's also a line of dialogue from one of the characters who hasn't really been featured a lot, but nonetheless has been playing a key role, and finally we get to see more of what that is, and again it's inspired by Rowling, something I wished she had done rather than what she did, in this instance. But more on that later. The Temporal Element anthology now available! IWSG November 2014: My Insane NaNoWriMo Approach This Year! Extremely interesting but also esoteric and drastically more limited in lasting appeal than Swift's more famous Gulliver's Travels. Basically the equivalent of Internet chatter in his day. Dean Motter provides a typically amusing look at the past's version of the future. Intriguing parable about subcultures are their self-isolating methods and justifications. Nice little memoir from a geek in transition. Part standard thriller, part awesome cosmic adventure. If you think Superman is culturally significant, this is a book for you.